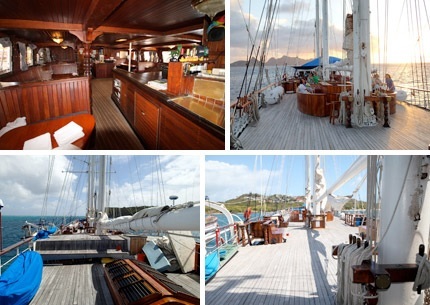 on the S/V Mandalay from the Port in St. Lucia and return the following Saturday. We will be visiting a selection of islands in the including St. Lucia, St. Vincent, Tobago Cays, Mayreau, Bequia and possibly some other stops along the way! St. Lucia Sailing boards Sunday night around 5pm and returns early Saturday - 10am, allowing you to connect in anytime Sunday and return early Saturday morning if desired. Grenada: Our home port for the S/V Mandalay, where you will begin your sailing adventure! Known as the “Island of Spice” because of the abundance of locally grown spices, Grenada is one of the world’s largest exporters of nutmeg. With a population of approximately 110,000, Grenadians are quick to share their island with unmatched warmth. Explore the island to discover amazing waterfalls, exceptional views, gorgeous beaches and opportunities for water sports and diving. View some of the only underwater sculptures in the world, created by English sculptor Jason de Caires, on an easily accessible dive or glass bottom kayak. Bequia: Known as the “Island of the Clouds”, Bequia has a charm that has you feeling like home from the moment you arrive. Stunning sandy beaches, lush hillsides and breath taking views will have you unwinding by the minute. Enjoy an island tour that will take you through local villages and views of the Caribbean blue seas. Top off your tour by visiting The Old Hegg Turtle Sanctuary, founded in 1995 by Bequian Orton King to assist in the conservation of the endangered Hawksbill turtle. View the turtles at all stages of life, from hatchlings to adult. Chatham Bay, Union Island: On the western side of Union Island, a magnificent bay with a long beautiful beach, backed by steep dramatic hills. A great spot for snorkeling, relaxing on the beach and soaking in the beauty of your surroundings. You can find beach bars that are operated by locals and enjoy a picturesque afternoon. on the island and experience local bars and restaurants like no other! Or enjoy picture perfect, white sandy beaches, for a wonderfully relaxing day in the crystal clear water. Tobago Cays: The Tobago Cays are an archipelago consisting of five small, uninhabited islands and make up the Tobago Cays Marine Park. Snorkel with the sea turtles in an established area off the beach in Baradel. Marked by buoys, explore this protected area to view turtles in their natural and magical habitat. Enjoy postcard worthy, picture perfect beach with leaning palms and white sand between your toes. Treat your eyes to views of every color blue in the Caribbean sea that you can imagine! Carriacou: One of the largest islands in the Grenadines, the island is 13 square miles where residents livelihood revolves around fishing and boat building. The main town and port of Hillsborough welcomes you with local shops and dining. Coral reefs surround the island, providing more great opportunities for snorkeling. Or soak up the sun on the beautiful sandy beaches. Enjoy an island tour to see spectacular views and local boat building, where locally made vessels are still in use today. Sandy Island: Just off the coast of Carriacou, this u-shaped island is uninhabited and a Marine Protected Area. You are sure to enjoy phenomenal snorkeling, thanks to the many coral reefs right off the island. Palm-fringed, white sandy beaches offer you tranquility and relaxation that will have you living your Caribbean dream. Enjoy the “rock sculptures” made by visitors to the island. 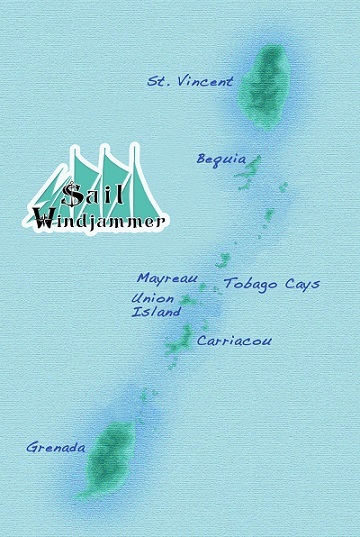 Port charges of $199 per person - are additional and payable directly to Sail Windjammer. 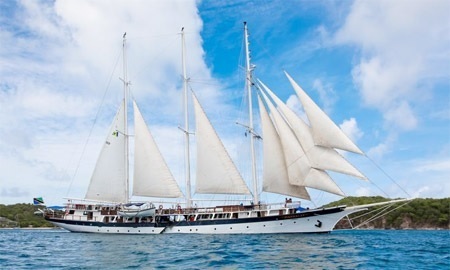 Before submitting please the calendar on the SailWindjammer.com website to find the regular 6 night cruises. Offer is not valid on specialty or 14 night cruises.